Eyebrow Tweezers: Which Ones Are The Most Efficient? What Are the Best Eyebrow Tweezers For The Job? There is a myriad of eyebrow tweezers out there. Now you’ll find out which one to buy for maximum efficiency. You’re going to buy a few tweezers in your life because they’re so small and easy to lose. So when you buy, get two or three so that you always find one when you need it. Keep one in your bag, another at your makeup station, and the other in a safe place for when you have no idea when the others went. That way you don’t have to get one every few months. The best tweezers are made from stainless steel. If not completely, all you really need is for the tip to be steel. Other materials are a little too flexible, and not sharp enough at the ends to really hold on to the hairs. I have bought plastic tweezers before( don't pretend you never had broke times:) ...) and as cheap as they were, they didn't work. As in-they didn't work! The tip could not latch onto the hairs because the material just wouldn't press together. So I learnt the lesson that plastic is not a material you want when you need precision! Hence I'm assuming that that's the case for any other material that isn't hard sturdy, steel. A slanted shape for tweezing full grown hairs is better than straight tweezers. It allows you to pluck the hairs from an angle while looking in the mirror. Straight tweezers are more difficult to use. The actual shape at the end of the tweezers’ tip is also important. If it’s flat and thick, it’s not as easy to grip the hairs. Then there is that little, thin stubbly growth when hair starts growing back. 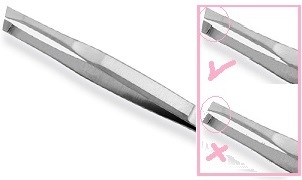 If you have great slanted, thin tip tweezers, then you can pluck them with the thin pointy tip of your tweezers. Otherwise, use pointy ingrown hair tweezers. Before tweezing, you hair must be supple. 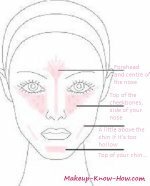 Put a warm compress on the brows before plucking. You can also run the tweezers under some hot water to warm them up. Then you’ll feel less pain when the hair comes out because they'll glide out easier. This is quite important. It means the hairs glide out easier. They will also come out from the roots instead of breaking off. If they break, you’re more likely to get ingrown hair bumps, and the area you’ve tweezed won’t be as clean as it could be. When you have your hard working pair of eyebrow tweezers, you can the move on to carving your eyebrow shape.